At their Tuesday, Oct.8 meeting, the Lincoln County Commissioners received a report about the damage in the county from the huge storm that devastated portions of Colorado's Front Range in mid-September. John DeWitt, the county's Emergency Manager, told the commissioners that two bridges were destroyed on County Road 43 south of Road S. The two bridges, located about a quarter mile apart on CR 43, were swept away by a flash flood on September 12. 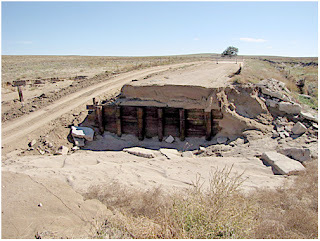 "Each of the bridges consisted on three six-foot-wide metal culvert pipes covered with a concrete rip-rap with a dirt overlay," DeWitt said. "They were completely destroyed. Some residents east of there reported rain measurements of 9 to 10-plus inches during the day the bridges were destroyed." As a temporary measure, DeWitt said county road crews have plowed detours around the destroyed bridges on CR 43 to allow traffic to continue to use that road after the flood. He said the bridges are currently in the process of being repaired. "Dave Seymour, the Road Supervisor in that area, also reported that there are approximately 65 other areas of road damage in the southern part of the county from that storm," DeWitt said. "They are mostly scourings and other damage to the road surfaces, but nothing as severe as those two destroyed bridges." DeWitt informed the board that he had already been in contact with state and federal authorities to seek assistance to pay for the bridge replacement and other road repairs. "Roxie (Devers, Lincoln County Administrator) asked me to look into disaster funding," he said. "As the Emergency Management Director, I was able to set up a meeting with FEMA (Federal Emergency Management Agency). 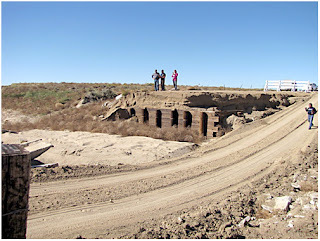 Three FEMA representatives and one from the Colorado Department of Public Safety came here for a site inspection of the destroyed bridges on Thursday, Oct. 3. They said we would probably meet the threshold for a disaster designation, but we haven't yet found out." DeWitt explained a disaster designation would make the county eligible for federal funding. If approved, FEMA would provide 75 percent of the funding with a 25 percent local match. The county also might be eligible for other mitigation grants that might pay to not just replace the bridges but upgrade them so that a similar flash flood would not destroy them again.